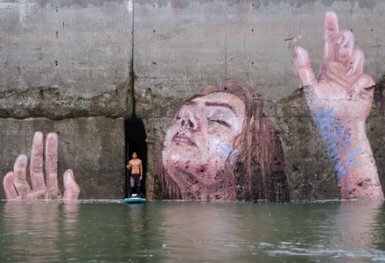 Influenced by his love of the ocean, world-renowned street artist Hula creates beautiful murals while balancing on his stand-up paddleboard. 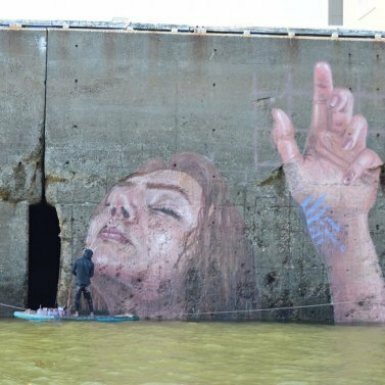 Hula battled the Bay of Fundy, home of the world’s highest tides, to paint a masterpiece in uptown Saint John at Pugsley Slip (Port Saint John) in August 2017. Hula spent nine days in Saint John creating a mural that measures approximately 48 feet by 25 feet. The mural helps depict the power of the tides in a beautiful urban setting. The mural is unveiled twice a day with low-tide. Discover Saint John and Strong and Free have partnered on this street mural.